EverFXGlobal is a forex broker. Ever FX Global offers the MetaTrader 4 forex trading top platform. EverFXGlobal.com offers over 50 forex currency pairs, indices, commodities, cfds, gold and silver for your personal investment and trading options. EverFX is an STP broker with a strict EU regulator, providing an efficient and reliable trading environment to traders of all experience levels, across the globe. Trade Forex, spot metals and indices via MT4 trading platform available desktop, mobile devices and webtrader. The company supports clients through their trading journey with the most competitive trading conditions including tightest spreads, instantaneous execution, flexible daily analysis and the highest quality educational tools. The company philosophy is to invest into the best available technologies in order to create the most efficient and safest possible trading environment for its traders. The previous people experience, I got registered in everFX by toolstrade.com referral. I have been trading with Ever Fx for some time now. Unfortuantely last week one by one all of my positions were closed with huge losses and minimum lot size was increased to 0.1. When I contacted them they had emailed me before (of course I have not received any email). So if you guys want to be safe, avoid these people completely. Otherwise one fine day they would make sure your account is blown. Takes out your money whenever they want. And poor customer service. Poor Support! When I asked tell me how to open demo account, they just give me link on some other website, did not say "Hi" or anything....Im afraid to try their broker, they looks very scam and not seriouse.! Ive screen of such unprofessional conversation! Stay away from such unprofessionals. You will lose your money with them. Have stolen $250 from me and refuse to pay it back. A company called Tools Trade took my funds and opened an account with Everfx without my permission. I contacted Everfx to try and recover my money. I was promised by Mr Courage Manesh that it had been paid to my account. No payment has been received to date. I have requested proof of payment but to date have been totally ignored. Clearly a bunch of unethical thieves. I dont know why you had any problems Evangelos? In my opinion this is professional broker with a decent MT4 platform, minimal spread (even from zero pips!). Support team is also impeccable – you can hear right away that you are talking to a professional, not a traitor. Spreads very often you can catch on 0.01-0.02 pips, sometimes you can see zero as well. Even with the commission is still very low comparing to other brokers. More over STP model is far enough for me to trade and do not looking for another broker. I can really recommend EverFX! This review did not come from Poland. 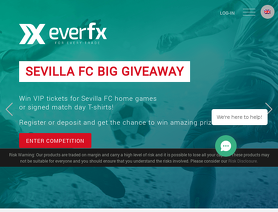 It came from the same location in Cyprus used to register an account belonging to EverFx support. The jameslove1 account was also used to pretend to be a happy client of EverFx inside the FPA's forums. Per FPA policy, the rating on this review has been set to Zero stars. The FPA does not appreciate forums spammers. The FPA does not appreciate review spammers. Great broker, 1 of the best broker I have work with. Low spread + commission and quick customer service. Slippage is good and no requote. I have work with this broker since begninning of February and made my first withdrawal some days ago. Got money into my E-wallet after 1 day. * The only minus of this broker that they take fee for withdrawal to E-wallet. Next time I will withdrawal throught bank tranfer (zero fee). Terrible Scam.Stay away from this broker. I opened one account 02/02/2017 No.100177 and i am profitable in the start. After i try one withdrawall 100$ by visa but it was possible.They want make withdrawall from my bank account,not make deposit.The problem it was with their server.Wednesday at the news 08/03/ at Cyprus time 15.15 I had open two positions in usd/jpy one long 28808 and one short 28731.Their server it shut down.I trying close one position but is impossible for 24 minutes.I had open and the MT4 at my other broker was perfect. Feb 10, 2017 - 5 Stars I opened live trading account with Everfx and had just my first profit successfully. The overall broker impression is good and since I joined them I seldom found any issues to complain.Trading is easy with low zero spreads on major pairs. I am trading regular account and it has decent leverage too.The support is excellent and fast every time from Mrs Claudia.